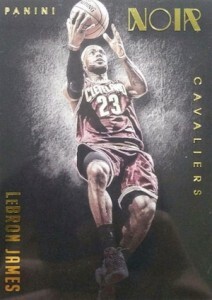 2014-15 Panini Noir Basketball is a late-season offering from Panini that caters to the high-end with an artistic flair. Each box promises a total of seven hits and all cards are signed on-card. 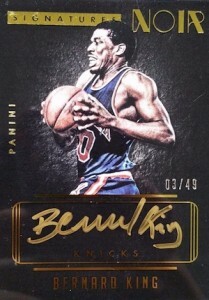 Covering former greats, current stars and key rookies, 2014-15 Panini Noir Basketball includes several insert options. Autograph Patch features rookies and Autograph Prime includes veterans and retired players. Both include contrasting options by way of a color and black-and-white version with mirrored designs. 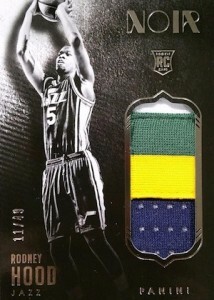 Rookies are also found in Rookie Patch Autographs and numbered to just 99. 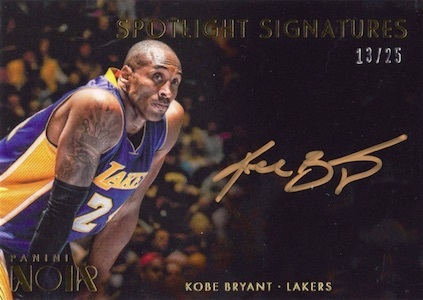 Spotlight Signatures add a paint pen signature to impressive player images. 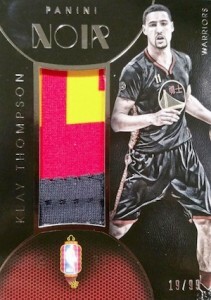 On the memorabilia front, 2014-15 Panini Noir Basketball includes special game-worn jersey cards with the Chinese New Year insert. The Chinese New Year jerseys were worn by the Houston Rockets and Golden State Warriors during the 2014-15 season and are exclusive to Panini Noir. Although the product was originally intended to be an international-only release in the same vein as 2014-15 Gala Basketball, a small amount will be made available to U.S. distributors. 200 cards. Shop for base cards on eBay. Not all subjects available in parallel set. View spreadsheet for specific print runs. There arent many products i can grade over 3 stars until i see them opened by the case. Should I even ask the Price? the factors to recieve more than 3 stars are design, price. collation, all teams are represented on a equal basis(as much as possible) , what each box contains vs price paid., resale value and demand. Companies are happy just making money and ignore collectors preference to thier chase teams. First off they are great looking cards. But the price point and odds of hitting anything great is so low. Out of all the big sports basketball is the one that really only has a handful of superstars that will hold any value to their cards. 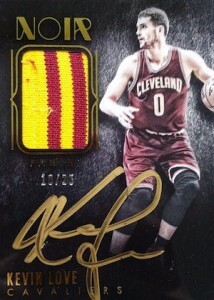 I see this down the line being a very big mistake for anyone buying it and gets a couple of rookies that are out of the league in four seasons and a Scott Skiles auto. Even when you do hit a big card the price on the box still doesn’t warrant it’s value. This is purely made for group breakers with the price point out of reach, many hits, and easy and fast to break a case. This is were the hobby is going. More expensive products that you can only gamble on by buying into a group break and hope to hit a team hit. Nice job Panini offering a high end product that comes out tomorrow and holding off showing the checklist till after pack out so collectors can’t see the odds of getting ripped off. And when in the hell did $799.99 become just high end. In my book something for $799.99 is super platinum diamond ultra high end. I guess products at for $150 is considered by Topps and Panini to be low end. This product is a literal contradiction in terms. On the one hand, priced at $799?Noir can only be called an “Ultra-premium” product. If anyone can derive a label that better described the brand’s price-point, please…feel free to do so. While the product is priced stratospherically…. the early returns appear somewhat mixed. 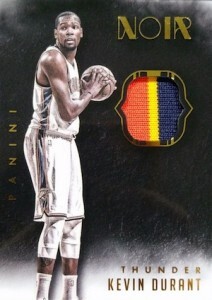 Panini released a 2-box peek at the product on their excellent blog, “The Knight’s Lance.” And, while the Andrew Wiggins and Julius Randle auto patch rookies #/99 are super scarce and therefore super pricey via the secondary market. 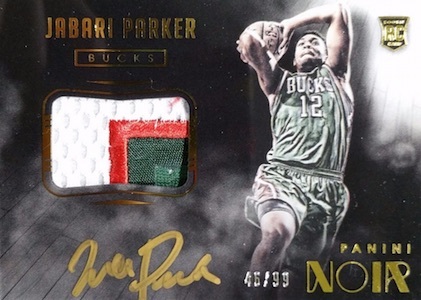 However, autos from the likes of Scotty Skiles, Robert Horry, Nik Staukas, Noah Vonleh and Kyle Anderson, among other issues found in Panini’s 2-box break, are neither scarce nor sought for their investment upside. The bottom-line, for me, is in keeping with comments made above by Mike Perreira; I also believe that Noir was designed, created and rolled-out to “the international market” to capitalize upon the exploding “group break” phenomenon…& I don’t blame Panini for wanting to help facilitate growth in that quarter. 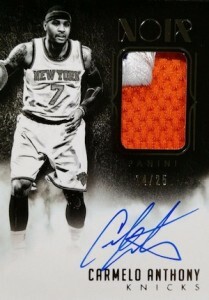 The market for $800 / 1 pack “boxes” of Basketball cards is, by design, quite small. The “breakers” are typically collecting a particular player or team, and they are not as concerned with return on Investment as other collectors traditionally are. With that caveat dispensed, it’s a very special collector indeed who will do more than snipe a card or 2 off of eBay. There are some very interesting patch cards in this product from China and overseas, thus affording Noir with a novel twist and niche that products such as National Treasures, Immaculate, Flawless, Spectra, and Gala lack. But the aforementioned underscore just how many super high-end products consumers can break. Chinese League patch cards?? Will that be enough to propel Noir and “The $800 Box” forward? We shall see.